CES 2011: What's new from Intel? Sandy Bridge looks stunning. CES 2011: What’s new from Intel? Sandy Bridge looks stunning. In 2010, the Intel corporation boasted sales of more than 1 million computers a day and 30 million netbooks in total. In August 2010, they bought McAfee, an anti-virus software manufacturer for $7.7 billion in cash. Intel has also been working side by side with Google on smart TVs and Chrome OS products. So, what’s new from Intel? It smells like peanut butter and chocolate in here (due to the Reese’s on everyone’s seat) but today’s announcement is all about enhancing your visual sensory experience. The “eye candy” is the 2nd Generation Intel Core i7-2720QM featuring their much anticipated Sandy Bridge processor, which was unveiled today at the Consumer Electronics Show in Las Vegas, NV. “We’re coming together this year at CES at a fantastic time for our company and for our industry. Intel is coming off of our best year ever. The integration of the microprocessor and the Internet are the foundation of an ecosystem that Intel is building around smart TV, netbooks, tablets and cars,” said Paul S. Otellini, President and CEO, Intel Corporation. But today’s announcement is focused on the PC, the great Darwinian device that reinvents itself year after year to become more innovative and more affordable to more people around the world. According to Mooly Eden, VP and GM of the PC Client Group, we send 247 billion e-mails and watch 2.5 billion videos a day. In addition, 2.5 billion photos are uploaded every month to Facebook alone. Intel wants to deliver a better user experience for this content, and that means better, faster graphics. Today, Intel unveils “the next evolution of the PC” featuring Sandy Bridge, its highly anticipated microprocessor. The processor takes advantage of the latest graphic technology and 32 nanometer silicon technology. In fact, Sandy Bridge is the first 32 nanometer based graphics engine in the industry. Sandy Bridge is also the first microprocessor that integrates HD processor graphics, a shared L3 cache that is both part of the graphics card and the low power, high performance core side. It features 1.16 billion transistors on one chip. Which is impressive, considering the human brain has anywhere between 20-25 billion “transistors,” or synapses (artificial brains here we come!). Sandy Bridge’s advanced architecture gives users the ability to transcode (moving video from one format to another seamlessly) in record breaking time. For example, the processor can convert an HD formatted video into an iPad or iPhone format in under 16 seconds. The new processor also allows users to edit and watch 3D Blu-ray videos, and then send them wirelessly from a laptop to a large-screen digital TV. Sandy Bridge is Intel’s best integration with Microsoft to date. Otellini says it will represent over 1/3 of Intel’s corporation’s revenue and a total of $125 billion dollars of revenue for the PC Industry. Eden streamed highly interactive games putting us into a Minority Report type world and stunning clips from action movies like Inception. Watching the top of the line graphics makes you never want to look at any other kind of visual again. It’s hard to communicate the experience, but it’s like how I would imagine someone putting on their first pair of prescription glasses. That “ahhh, much better” moment. 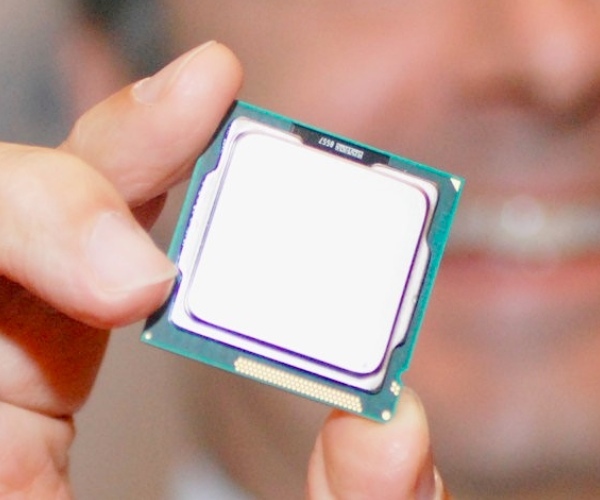 The 2nd Generation Intel Core i7-2720QM is 831% faster than their previous model. Watch this video for further explanation here.